Oregano oil is a potent panacea that effectively prevents infections, including stomach and respiratory ailments. As an antimicrobial, it inhibits bacteria, yeast, fungi, and parasites. 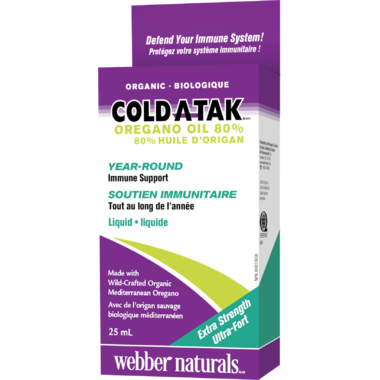 Webber Naturals Cold-A-Tak Oregano Oil Extra Strength is derived from organic, wild-crafted oregano in a base of organic olive oil. This product is free from gluten and GMOs. * From Wild-Crafted Organic Mediterranean Oregano. The oil is extracted from the handpicked leaves using steam-distillation, ensuring that the oil is chemical-free.